Prodos Games LTD Forum • View topic - Exclusive miniatures at Salute. Post subject: Exclusive miniatures at Salute. "Are you going to Salute this Saturday in London? Visit our stand to get show special minis of Alien Warriors and many more other fantastic models! If you wish to collect your AVP pledge - just bring it printed out and have ID with you. See you at the party!" Post subject: Re: Exclusive miniatures at Salute. I got it through there newsletter. I'll just sit here in NZ....slumped....waiting for any of my stuff....It's good to see most people getting something...but I still feel that all the pledges $2k+ like myself are being left to the end with no real benefit....just delays and products getting less and less like the KS pictures. Not complaining...but man I want some of those Warriors to mix in with the other ones. I would love to see some more marines. The Aliens habe a lot of foot troops but the Marines only this one set. Unless you would get the Weyland Commandos. But I don't want to get and mix them together with the Marines. There are 2 sets of Marines. 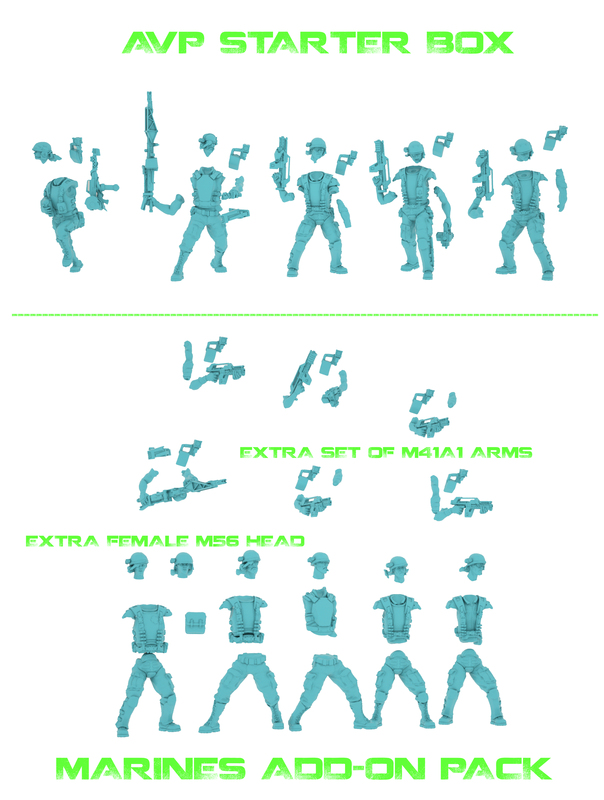 there's the Add on Marines which aren't released yet. Probably wave 3....logically. Oh. I think I never saw those. Only know the normal marines from the box and the Sargent and Lin. Are there photos of the other ones? I understand how you feel, because I feel exactly the same. Not in NZ, but in The Netherlands. Is there anyone in the UK can pick me up a set if I send them the cash? didn't even go to their stand to be honest, show exclusive minis or not. Sorry cannot find the pic comparing the Add-on marines to the box set marines. The Main difference is that the add-on marines are piece by piece instead of being in large pieces, allowing more flexibility when constructing, however I am worried that isn't the case anymore now they are single casting....which I personally don't like because of painting reasons....fudge getting into those cracks with care. [At the top you can scroll through dates to get to after the KS closes, includes all updates, etc.